every morning a group of young volunteers cruise the polluted waters of the famous Dal Lake in Srinagar to collect the refuse of the lake dwellers. They go from houseboat to houseboat, collecting garbage and then back to the shore to dispose of this waste. This practice has been a routine for them since 1996. Meet the volunteers of Human Objective to Protect Environment ( hope ), a Kashmir-based non-governmental organisation ( ngo ), which is run by seven trustees, all of whom are students between 20-30 years. Its success can be gauged by the fact that around 80 per cent of solid waste generated by the lake dwellers and houseboats, which was normally thrown into the Dal Lake, is now being disposed of safely. "It is our duty to collect the plastic waste from the lake dwellers and safely dispose it of. Plastic waste is the biggest polluter of the Dal Lake," says Yasmin Ali, executive secretary of hope . "We started our campaign by requesting every lake dweller not to dump his garbage in the lake. Intially we were snubbed by most of the people, but this did not deter us and we went ahead with our awareness campaign. Today, these people listen to us and also try to act on our advice," says Ali. But the organisation is unable to take any legal action against a person found guilty of polluting the lake. "The lake area comes under the purview of Srinagar Municipality and they are authorised to take action against any erring person. But they hardly do anything about it," says Ali.
" hope has really brought a ray of hope in our lives and thanks to the work being done by its workers our business has been boosted. Even the tourists are feeling the change," says Ghulam Mohidin, a houseboat owner. The organisation gets most of its funds from the Jammu and Kashmir Lakes and Waterways Development Authority ( jklwda ). The authority gives Rs 14 per house every month for the collection of garbage. "Besides collection of garbage from Dal Lake households, we also collect garbage from commercial establishments like houseboats and shops. But we are being paid for households only. We have applied for a hike, as the amount jklwda pays is very meager," says Ali. The workers of hope have also taken their campaign to other areas of Srinagar. They have started functioning in two colonies, Rawalpora and Qayoom, on an experimental basis. In Rawalpora, hope is charging money from the people for disposal of solid wastes. "Seeing our work the people of neighbouring colonies have requested us to extend our services to their areas as well," adds Ali. "If you visit Rawalpora and Qayoom you will see the change. We have not achieved 100 per cent success, but we can say 80 per cent of garbage generated from these two colonies is taken and dumped. The roads are no longer littered with polythenes bags," asserts Ali. The people of Qayoom and Rawalpora feel ecstatic regarding hope's work. "When they offered their services, we were skeptical about their success. But now we feel that we do not need municipalities at all and if ngo's are encouraged to work, most of our civic problems will be solved," says Ghulam Nabi Khan, a resident of Qayoom colony. hope is planning to collaborate with the government for setting up a compost plant for disposing off the solid waste in a eco-friendly manner. 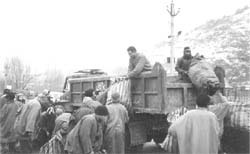 "Srinagar Municipality contemplates to set up a compost plant at Aschan near Zunimar. We are also lobbying for this plant and are trying our best to succeed in this endeavour. We are in constant touch with the government in this regard," says Ali.